Check out Philadelphia's good sides with this combo pass, seeing the best of Philadelphia by day, from above, and lit up at night! Your pass includes a daytime hop-on hop-off sightseeing tour, admission to the sky-high One Liberty Observation Deck, and an evening double-decker twilight tour. Start with your hop-on hop-off tour and enjoy live commentary aboard an open-top, double-decker bus (covered trolley in the winter and inclement weather). As you travel a 1.5-hour loop to 27 different stops, you'll see Philadelphia's 100 most popular attractions and be able to hop on and off as you wish. With a 360-degree view of Philadelphia, you'll be speechless and entertained while soaking up the history, heritage and beauty of one of America's oldest cities. Visit the One Liberty Observation Deck to soak in the sights of Philadelphia from an even higher vantage point. The Observation Deck sits 57 stories above the city and offers sweeping views, plenty of photo opportunities, and educational touch screens offering closer looks at key landmarks. One Liberty is open day and night, so you can choose to see the city during the day or under the moonlight. Cap off your day of exploring by seeing the sights lit up at night. 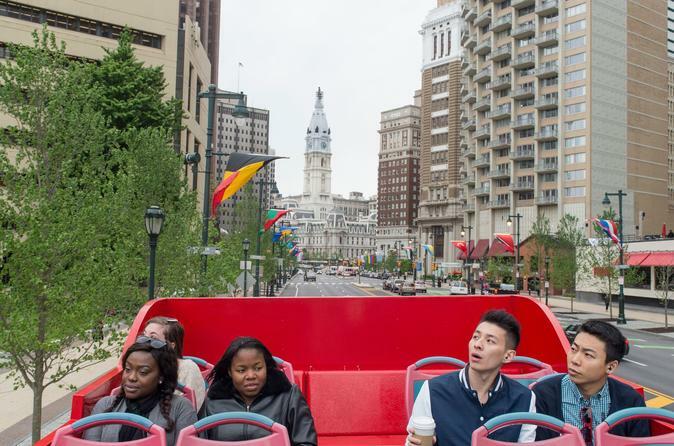 Your evening tour by double-decker will include live commentary as you travel the 1.5 hour loop again, seeing the City of Brotherly Love glowing under the night sky.